Before starting Case and Point I had been writing for years. Some of that writing took place on Bleacher Report. The summer time is traditionally pretty dull so I figured what better time to look back at some of my favorite pieces from Bleacher Report? Today, why Super Bowl XLIII was More than Magical. For me, the 2008 season started much sooner than September against the Texans. Way before the first pre-season game in August. Much earlier than training camp in Latrobe. For me, the 2008 season for the Pittsburgh Steelers started a year ago today with a phone call from my mother. My grandfather of 83 years had passed away in his sleep. My grandfather was the reason I became interested in the Steelers. Born in 1984 in Carnegie, Pa., I lived with my grandparents for six months while my mother (separated from my father after his doings) set up shop in Mechanicsburg, Pa.
Every year, three or four times a year, until 1996, when we moved to South Carolina, my mother and I would make the four- to six-hour drive to Carnegie to see my grandparents. My grandfather took me to my first Pirates game. My grandfather and I would sit around the TV during the winter and watch Steelers games on Sunday, his failing eyesight still good enough to see when a ball was trapped and not caught. The last time I saw him alive, he gave me a 70s era Steelers knit hat that I promised to take with me if I ever got to a Steelers game. Down in Charleston I work for a radio station. Mere weeks after coming back from Pittsburgh for the funeral, I'm working an event for children. A woman who wrote a children's book wanders over to my work tent while she's bored, and we start chatting. Over the course of the conversation, I find out she's from Ohio. I mention I'm from Pittsburgh, I find out her fiance is from Pittsburgh as well. As the day wore on, her fiance makes his way out to the event and we start to talk. As it happens with other fellows from Pittsburgh, we're immediately like family. We talk about where we're from, we talk about family, we talk about sports. I find out that he is a Steelers season ticket holder. When I say I'm jealous because I've always wanted to go to a game I hear, "Well you keep in touch and if you ever want to go to a game, let me know!" Over the next few months I keep in touch with the family. I'm invited over to their house to watch Game Six of the Stanley Cup Finals. I'm invited to their wedding. I help them move into their new house to fit the two families together. I was also invited to watch games at their house every week. I also picked my first game to go to: Nov. 9 against the Indianapolis Colts. For the first time, I was watching every game on TV. Not just depending on highlights or being in some noisy bar. I was with people I knew, surrounded by Steelers fans, with friends. A 60-inch HDTV, surround sound, good food, and great people made every Sunday, the occasional Monday and Thursday more special than it had been before. Finally, the day came around. I flew to Pittsburgh to spend time with my grandmother, went to a Penguins game, and finally Sunday came. I arrived at noon at Heinz Field with my friend Aaron, who had given me a free ticket to a Penguins game while I was in Pittsburgh for my grandfather's funeral. We met up with Paul, Shawna, and family. I had some drinks, some spicy sausage, some pierogies. I explored Heinz Field's exterior. Finally, 3:30 rolled around and finally I entered. Twenty years of waiting had finally come to an end with seats 15 rows from the field in the back corner of the open end zone. Though the game ended in a not so fortunate way, it was a dream that finally came to fruition. By total coincidence and good timing did I meet the people that made it possible, and they are still dear to me. It made me believe that my grandfather was watching, directing it to happen. Every game that happened thereafter felt special. I felt like I'd finally been a part of the season, of something amazing. The playoffs started and I was looking forward to a few more games. I figured the Steelers would be knocked out by the Colts or the Titans. Even if they made it to the Super Bowl, the other two teams the Steelers lost to would likely be in as the NFC champs, the Eagles or Giants. Then, one by one, their biggest challenges fell. The Colts were knocked out by the Chargers, who were then easily dispatched by the Steelers. The day before, the Ravens took out the Titans. In the NFC, the Eagles beat the Giants. The Steelers had already beaten the Ravens twice. The next week, they made it three times and the Cardinals pulled off something short of a miracle, knocking out the last true test for the Steelers, the Eagles. 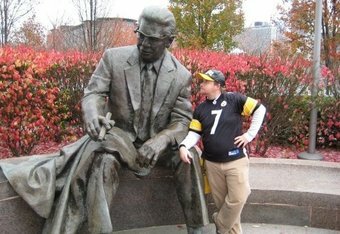 As two minutes remained last Sunday, the Steelers backed up to their own 15, I hoped my grandfather was looking down again. As Ben and Santonio Holmes marched down the field, I was tense. Holmes broke free for a long play, down into the 10. The pass to the left end of the end zone. Holmes lets it go through his hands. And then the catch. Two feet down. Complete possession. The Steelers were six-time Super Bowl champions. My team had a drive for the ages. I had my season, and it ended in amazing fashion. My grandfather was smiling on high. And you better believe I was wearing that hat.